Welcome to the House at the End of the Road, the online abode of Alice M. Cole. It got rave reviews from the family. Very rich and fudgy, with a nice texture. Vanilla ice cream made a great accompaniment. I made it exactly as written, except that I used a souffle dish instead of the cake pan, and I used orange Liqueur instead of the melted jam. It would probably be good with most any jam or liqueur. I will definitely be making it again for a special occasion when calorie count is no object. So I’m heading off to visit my family in Montana. It was the only time that worked for us. The weather’s supposed to be cold and snowy, so hopefully that means time to sit in front of the fire and write. More likely, however, I’ll be sitting around chewing the fat with family members and eating too much barbequed ribs and chicken fried steak. One of the fun things about writing steampunk is playing with all the pretty Victorian fancy dresses. Oh, and I’m up over 6K for the novel, so it’s coming along nicely. 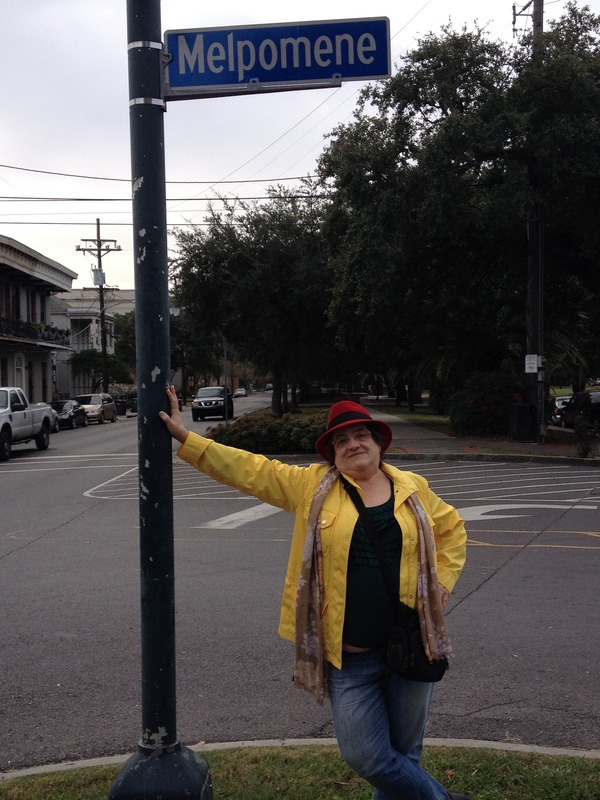 I just realized I forgot to actually publish this photo from last Christmas in New Orleans! Me under the sign of the muse 😀 This neighborhood may or may not play a role in the ghost story in progress (working title Lady in Lace; most of it takes place in the French Quarter), but it’s playing a big role in my psyche since I visited there. Well, middlest is married and heading into the future with his wife. They’re back in California, moved into the new apartment with room for a baby due in February. They’re excited and happy. So are we. We’re making plans to be out there when the baby comes and trying to get our heads around being grandparents. All of which is massively distracting. I had thought I’d come home from the wedding ready to get back in the saddle and just turn out the words the way I used to. It was so easy to think that the wedding distraction was why I wasn’t getting any writing done. But of course there’s always another distraction. Sometimes you do have to let real life take over, but most of the time it’s just another factor to be dealt with. There are always distractions. I have to write anyway. Get back in the saddle. Make words instead of excuses.